Lisa joined the Covenant team after most recently owning a title insurance and settlement agency. Initially she worked in several law practices, learning as much about the legal world as she could, and then developed a strong customer service work-ethic while being a front-end manager in the grocery industry. 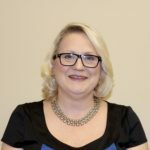 After starting her career path in Harrisonburg, with a stop in Roanoke along the way, Lisa landed in central Virginia over a decade ago. Lisa enjoys the people part of the business the most and thrives on putting together the pieces of the puzzle that leads to satisfied buyers and sellers. She values the trust that the lenders, REALTORs, and attorney clients place in her to assist them with their clients’ transactions. She thoroughly enjoys serving her area and utilizing her extensive local knowledge and familiarity to get closings done in a professional, accurate and timely manner. Outside of the office, Lisa enjoys gardening, spending time with her children and grandchildren, home improvements, reading, and relaxing with her little dogs. She’s also been know to rescue a kitten, a squirrel, or a bird or twenty along the way.